I tried making kaya with the bread machine...but it was a complete flop :'( couldn't really pin point what went wrong...except I could have used coconut cream instead of coconut milk, the kaya was not smooth at all, it looked like a bowl of scramble eggs, haha! I still didn't want to throw it away though...will keep it in the fridge until there's a need to clear space for other stuff! Was deciding whether to give the chocolate swirl bread a second attempt, but was too lazy to do anything too complicated other than a simple loaf. I made this country-style wholemeal round instead. Presenting my first rustic loaf! I would usually make soft sweet bread as my kids don't really like rustic kind...they find them too hard, coarse and chewy. Nevertheless, I went ahead with this as I really wanted to give rustic bread a go. It was a rather straight forward bread with very basic ingredients, there's no eggs or milk added. It is also not written anywhere in the recipe that there is a need to spray water in the oven, to create steam for the bread...something I am still a little afraid to try, as I wasn't sure whether it is necessary...since my oven comes with a function that will diffuse vapour? I used the bread machine to knead the dough for 20mins and left it to rise in room temperature. I must say, our weather here in Singapore, with a typical room temperature of 28~30 degC plus the high humidity all year round...is really good for rising bread. The dough would usually double the size within an hour. It was very easy to shape the dough as it was not sticky at all. After punching down the dough to knock out the gas, simply give it a few knead and then lightly flatten it before shaping it into a smooth round ball. The trick here is to shape the dough as if you were filling it with some fillings, and gather all the loose ends and seal them together. Let it proof for another 30mins before dusting it with some wholemeal four and making 2 long slits (I made 4 instead! wanted to make 3 but due to my wrong judgement, got to make 4 cuts to make the dough look balance), and it is ready to send into the oven. The crust of the bread was crisp and I really like the "look and feel" of the rustic loaf, not forgetting the smell of the bread when it was fresh out of the oven. I was pleasantly surprised to find that the crumbs were rather soft and tender, the texture was very much like a slice of wholemeal sandwich bread. Here's the recipe for the bread which I have taken from a Japanese-Chinese translated cookbook, 面粉点心大会串. Place bread flour and wholemeal flour in a mixing bowl and stir with a whisk to combine. I did this by measuring both types of flour in a plastic bag and then give a few shakes to mix the flours. Place all ingredients (according to the sequence as stated in your bread machine manual) in the bread pan and set the machine to the Dough setting. You can either leave the dough to proof in the machine, or let it proof in room temperature. If you are proofing the dough in room temperature, place it in a big mixing bowl, and cover it with cling wrap. Let is rise till double in bulk, takes about 1 hour. Remove dough from bread machine/mixing bowl. Knock out the dough and give a few light kneading. Gently flatten the dough and shape into a smooth ball. Place dough on a baking sheet lined with parchment paper. Cover with a damp towel or plastic bag and let it proof for another 30mins. Note that this time round, instead of cling wrap, you should cover the dough with plastic bag, as the cling wrap may stick onto the dough and prevent it from rising properly. Preheat oven to 180 degC. Dust with some wholemeal flour and make 2 long slits on the dough with a sharp knife. Bake for 30mins until the crust turns golden brown. Remove from oven and let cool on a rack. Lovely wholesome bread. I love thr rustic look here. Think it'll go well with a creamy mushroom soup. Yummy!! Hi lafillefolle, I can't wait to see your postings! hehe i'm going to try your durian muffins! :) mom and dad love durians so i think they'll like the muffins! one question (okay a series of them) though: where do you usually get all your baking stuff? are there shops specialising in baking ingredients and equipment? i remember there used to be one at hougang but i'm not sure if it's still around :\ oh or can you find most of everything at say, ntuc? Yes, I did try to pass it over a strainer, but it didnt work...my strainer is too fine, only some juice went thru, haha! and I don't have a blender :( but I am not gonna give up...will try it again soon! Hi lafillefolle, do remember NOT to use Thai durians...it's less fragrant...should use those from Malaysia. I usually get my baking equipments (pans, paper liners) from Phoon Huat...you can refer to their website for the address of the various outlets. There's one outlet near Hougang Mall. There is another baking supply store by the name of Sun Lik, at 33 Seah Street. I get basic ingredients like flour, butter, baking powder/soda from NTUC, coldstorage or carrefour. 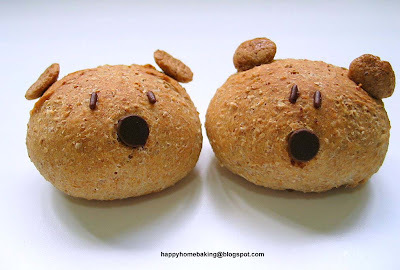 Hi ^cherie, do give it a try...but for small kids, I think they will prefer soft sweet buns...and guess it will be easier to stick the stuff onto the buns as the dough is more sticky compared to a wholemeal dough. btw, you can also use almond flakes for the ears...have fun! Hi. 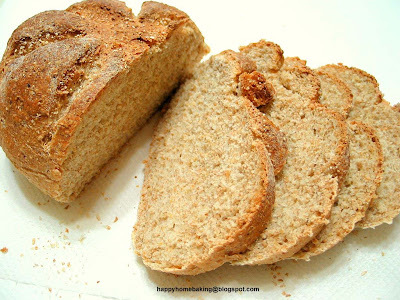 I've just tried the hokaiddo milky loaf and used a breadmaker just like you did. however, my breadmaker did not have the 'sweet' function so i used the basic setting, which took 2hr & 50 mins. The bread turned out a failure =( it did rose but it sunk terribly at the last part. do you know what went wrong? can i also know the steps of adding the ingredients and how long did your bread machine took to bake the bread under the sweet setting function? but i was wondering, i dont have a breadmachine...how do i go about to make this bread? Hi Anonymous, for kneading by hand...mix all ingredients except water and butter in a mixing bowl. Make a well in the centre, add in the butter and water. Mix with hand to form a soft dough. Transfer to a lightly floured surface and knead until the dough is smooth and elastic and no longer sticks to your hand. This may take about 15-20mins of kneading. Then proceed as step2 in the above recipe...ie place the dough in a mixing bowl, cover with cling wrap and let it rise. and proceed with step 3 & 4. Hope this helps. Your wholemeal bread really inspired me to try. It looks so delicious and healthy. May I know what is the different between whole wheat flour and whole meal flour? Are they the same things? How long can it last for the wholemeal bread? btw, I saw your blog posting! but I can't seems to leave any comments? I like your curry buns!! They look so lovely! I think children hardly accept those dense and rocky bread, perhaps they would love it when they are growing older. Can't wait to see you soft wholemeal bread. Is it also consists with many wheat flour? Sorry that I'm not very good using this blog and forgot to add the comments feature. I've posted the curry bun recipe if you like to try. Happy to know you. Have a good day! Not to forget ... wish you Happy Mother's Day! You are really a wonderful mother! May God bless you healthy, happy and cheerful day! hi, can i use this wholemeal bread recipes for the hot dog rolls and ham&cheese buns? how much water should i add into it if i'm using wholemeal breadflour? still the same? Hi Anonymous, I don't think it is advisable to replace bread flour with wholemeal flour for the other recipe. The amount of water has to be adjusted, and I am not sure how much is required. 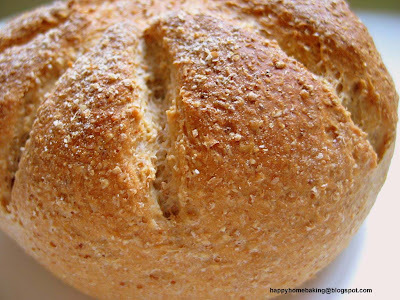 Maybe you would like to look for other wholemeal bun recipes. I'm sorry I'm of not much help here. by the way if i'm using wholemeal breadflour, isn't it the same as ur bread flour+ wholemeal flour? can i just use 300g of wholemeal BREADflour instead of 150 breadflour+ 150g wholemeal flour? Hi Anonymous, My apologies, I misunderstood your earlier comment. I thought you were asking whether you can use wholemeal flour instead of bread flour for the hotdog and ham sweet buns recipe. As my knowledge on baking is rather limited, and I have not used wholemeal bread flour before, I am really not in any position to advise whether you could replace it. You may want to give it a try, and adjust the amount of water accordingly, I think you will probably need to add a little more water so as to form a soft dough. your wholemeal bread looks really yummy! if i wanted to use a breadmaker to bake the bread, which function do you think i could use? the basic? Hi Edel, I have not tried using the bread machine to make this bread. Maybe you can try with the Whole Wheat Setting which is for wholemeal breads. I want to make this recipe but I do not have a bread machine. Will I have to change the sequence of ingredients up a bit? Or do I just throw everything in the mixer? Thanks. Hi Sophia, I have not used a mixer to knead a bread, maybe you can check the instruction manual of your mixer. I know that some mixer (eg Kenwood), liquid will go in first before the flour. I quite new in baking bread. I would like to make this recipe, but can i mix all the ingredient and leave it overnight in the fridge for proofing? The next morning only start with the kneading process. Hi Babe KL, for this recipe, the kneading comes before the proofing. With my limited knowledge on bread making, I am not sure whether you can leave it over-night and do the kneading the next day. Sorry, I am of not much help here. I went through a few sites and they all point me back to yours! 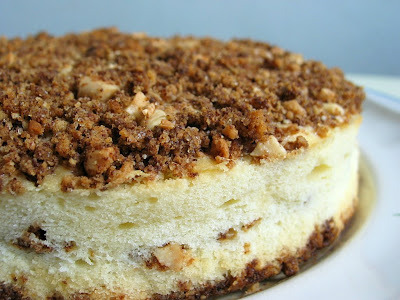 Seems like you are now the big sister of blog recipes online in our region! I made this today and it was so good and fresh. Fed my baby and hubby well. They loved it. Thanks for posting. Btw, do you have a thin crust pizza recipe? Thought I read it on your site but couldn't seemed to find it now. hi galronni, nah, there are many experienced and professional food bloggers/bakers out there, I am no where near them, especially I have not attended even one baking workshop. Anyway, you have made the wrong link ;p You have actually tried another wholemeal loaf, but no worries. I recently learned that for real thin ones, the crust is made with plain flour, not bread flour. Hehee.. thanks for the pizza tip. I'll use your recipe and maybe change the bread:plain flour ratio for the thin crust pizza. hi, since u've baked so many bread before, can i ask, if using breadmaker machine to make wholemeal bread using wholemeal flour, do we need yeast? is it a must? Hi, yes, you will still need to use yeast otherwise the bread will not rise. Hi, just want to comment you make lovely bread, makes me want to bake one myself! 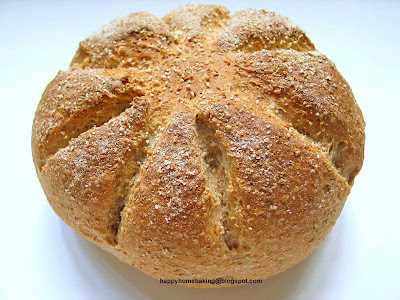 Hi Natasha, thanks for your kind comments, do give bread making a try, I am sure you will find it very rewarding to be able to make your own bread!